The offered Sigma Kneader excellent for kneading and mixing of highly viscous materials like dough, putty, rubber solution, adhesives, polymers etc. 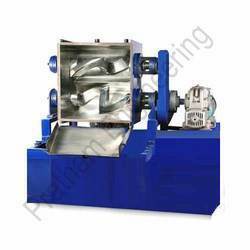 The mixing action is a combination of shearing, stretching, folding, dividing and recombining as the material is processed between the the sigma blades and the container walls. Jacket arrangement is is provided for heating or cooling application. Looking for Sigma Kneader ?